Stay at these centrally located Melbourne apartments, just a few minutes' walk to Crown Casino, Melbourne Exhibition & Convention Centres, Southbank restaurants, Observation Deck and Etihad Stadium. The MCG and Rod Laver Tennis Centre are just a short tram ride away. The BEST WESTERN Riverside Apartments offers modern and comfortable accommodation in Melbourne. Facilities include large living/dining room, fully equipped kitchen, laundry, air conditioning, cable television, high-speed Internet access, 24-hour reception and daily cleaning service. Undercover parking can be provided for $25.00 per night. 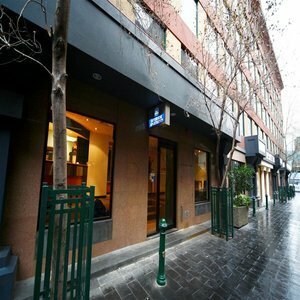 This Melbourne accommodation complex also includes Riverside Annex Apartments, described as the annex rooms when booking, which are located on the corner of Flinders and Highlander Lane situated on the first, second and third floors, just near our reception in Highlander Lane. For professional customer service and a central location in Melbourne, make a reservation at the BEST WESTERN Riverside Apartments today! Please note: all apartments are strictly non-smoking.